Watchung Reservation, a county park located in Union County, NJ, derived its name from the Lenni Lenape Indian word “Wachunk” meaning “high hills”. The park encompasses woodlands, open fields, lakes, streams, picnic areas, nature center, historic village, riding stables, and miles upon miles of bridle and hiking trails. Created in the 1920’s by the local community in order to preserve the area’s natural beauty, the park offers people easy access to the outdoors, including horseback riding, golfing, fishing, picnicking and hiking. Watchung Stables, located within the Reservation and owned by the county since 1933, has provided an opportunity for all people to learn how to ride, improve equestrian skills or simply enjoy the 26 miles of bridle trails which wander through the park’s 2,000 acre forest. In 1957, the stables burnt to the ground and operated out of tents for a year until the barns and arenas were rebuilt. Plans were laid in the mid-1970’s to extend Interstate 78 through the Watchung Reservation and the stables. Environmentalist and residents opposed construction of the highway. Concessions were made, the stables relocated in 1985 to the former NIKE missile site within the Reservation, and finally the Watchung portion of I-78 opened in 1986. Currently, Watchung Stables maintains a horse barn capable of stabling 99 horses, 4 riding rings, show ring, outside hunter course and an equestrian summer camp for kids ages 9 through 17. Years ago, a young 12 year old named Karen Walsh decided horses needed to be part of her life and it was her good fortune that her parents agreed. Her parents decided Watchung Stables would provide their daughter with an affordable and excellent introduction to horsemanship. And as luck would have it, the stable was located just up the road from their home. 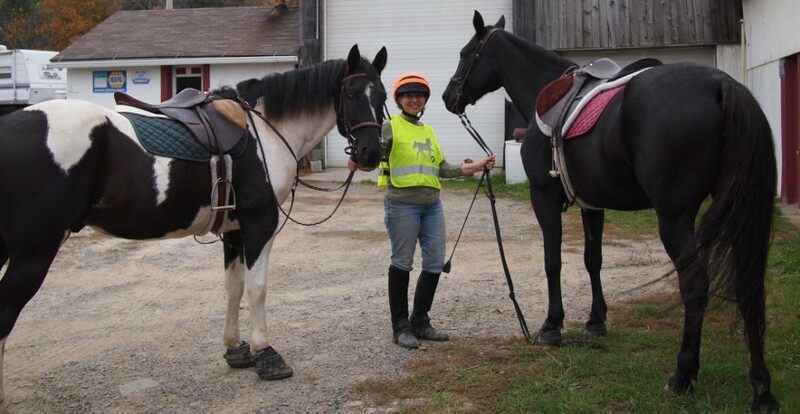 Karen began English riding lessons, and it wasn’t long before she was entering Hunter Jumping events at the many horse shows put on by Watchung and other stables in the area. Sometimes mounted troopers rode at the stables and the young girl watched the police horses execute their rider’s commands. 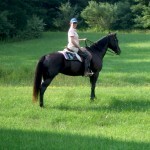 At other times, Karen enjoyed the solitude of riding for miles on trails through the forests of Watchung Reservation. A few years later, Karen went to summer camp for several weeks at Four Seasons Horse Farm, a private stables not far from Watchung. At Four Seasons, Karen focused on improving her seat, perfecting her equestrian skills, and expanding her knowledge of how to set the horse up for a jump. The teenager rode with other girls who shared the love of horses and dreamed of winning at horse shows. As it always seems to happen after taking lessons for a period of time and moving up through the ranks of young riders, a day comes when every experienced horseback rider needs a horse of their own. That day came for Karen when she turned 16 and became the proud owner of a 4 year old gelding named My Guy. Her new horse was not experienced in jumping so it became Karen’s job to show him the ropes. Karen soon found the horse could jump anything she tried. Even if she didn’t get him into the jump the right way, My Guy still flew over the fences. The jumps were picked up higher and higher until during a jump off at a show, the horse and rider cleared 5.6 feet. Karen boarded My Guy at Hilltop Stables owned by Clarence Nagro and his daughter, Sandra Lobel. She continued to ride in horse shows at Hilltop, Watchung, Fox Chase and Spring Valley for trophies and ribbons. Sometimes she won and brought home the trophy and hung the ribbons in her room. 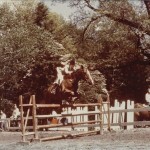 The shows were governed by the rules from the American Horse Shows Association. 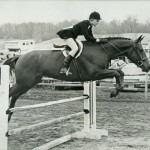 The young riders, under the age of 18, racked up points to qualify for the ASPCA Maclay classes at the National Horse Show held at Madison Square Garden once a year. The ASPCA Maclay was established in 1933 by Alfred B. Maclay, an ASPCA board member and president of the National Horse Show. The competition has been called the “proving ground of champions”. Many of the winners at the Maclay have gone on to compete in the Olympics with the US Equestrian Team. Besides trail riding and horse shows, Karen rode in a couple of fox hunts in Spring Valley organized by Hilltop Stables. The sound of the hunting horn rang out on a beautiful fall day to begin the hunt. Clarence Nagro, the Master of the Hunt and an ex-steeplechaser/jockey, had the final say over all matters in the field. Of course the hounds were looked after by a kennel-man or huntsman and a whipper-in who prevented the dogs from straying. The hunt was a drag hunt, so no live fox was involved, instead a gunny sack filled with the scent of an animal was “dragged” across the field for the dogs to track. The rider needed to be prepared to jump anything in the field including fences, ditches or other obstacles. A recession hit the country in the early 70’s creating financial problems for many people across the nation. At the time Karen had just graduated from high school and decided to take a job at a stable not far from Hilltop. My Guy was put up for sale and an older woman at Hilltop Stables purchased him to use as a jumper. Karen moved into a room at ABS Farm owned by Sandra Lobel. The days were long, about 10 hours each and never ending, that’s to say she worked 7 days a week. Her duties were varied, from cleaning stalls, turning out the retired thoroughbred stallions, helping with lesson horses that were misbehaving, grooming, feeding and watering horses. During the NY State Fair held in Syracuse, Karen groomed and generally helped out. Sandra breed racehorses and that year didn’t get the price she wanted at auction for two of her yearlings. 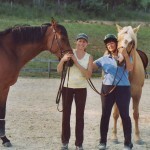 Karen helped teach the young horses ground manners and assisted in breaking them to ride, which included racing the thoroughbreds on a quarter mile track at the stables. After about a year working in the stables, Karen decided it was time to move on. There was no future working there. She didn’t see herself as a riding instructor or the possibility of owning her own stables. 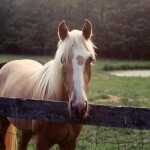 As so many young women discover, horses don’t easily make the transition to adult life. Karen felt she would never own or be around horses again. A few other problems haunted horse country in those days. Shortly after Karen arrived at ABS Farms a fire broke out at Hilltop Stables destroying the facility and killing My Guy. Another fire burned ABS Farms shortly after Karen left and several other stables had problems with fire. The cause for the fires was never discovered but some felt an arsonist may have been loose in the county. 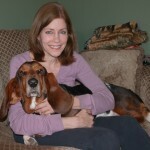 Karen married, changed her last name to Sykas, began a career, had children and moved to Warren Center, PA. Suddenly, horses were in the picture again. 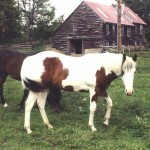 She purchased Lexis and Leo, both Quarter Horses. Her daughter, Helena, took a few lessons at Ballentine’s Horse Heaven from Sandy Mack and when Sandy left for Minnesota, Karen was given a black pony named Misty. Sometime later, Helena lost interest in the pony, and Misty was given to another young girl in the neighborhood. A few years passed by and Karen bought a yearling name CD from her vet Robin Rogers. Everything seemed to be running smoothly until Karen divorced and needed to sell her horses. Luckily, her sister, Dorren Deel, purchased CD and Leo and moved them to her ranch in Virginia. 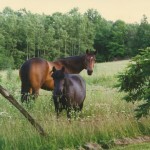 By that time, Lexis was lame, and the mare was given to a friend as a pasture buddy. Again, Karen thought horses would never again be a part of her life, until her friend Pam moved a horse to Ballentine’s Horse Heaven. Connie had a Quarter Horse name Jupiter to lease and Karen thought ‘why not’. I met Karen in the spring of 2010 and have enjoyed riding with her ever since. Life holds for all of us many turns and twists. However, it seems that once you’re bitten by the horse bug, it’s sure hard to get horses out of your system. I have a feeling Karen will have many happy horse adventures for years to come. This entry was posted in Uncategorized and tagged ABS Stables, ASPCA Maclay, Ballentine's Horse Heaven, Fox Hunts, Hilltop Stables, horseback riding, Hunter Jumping, National Horse Show, Northwestern NJ, Watchung Reservation, Watchung Stables. Bookmark the permalink. Wondeful piece-good work. Karen is a fascinating woman and an outstanding rider. days of my youth as well, but I was never comfortable going higher than three feet. 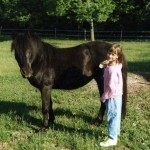 I had Karen’s son as a riding student for several years and Helena was always at the barn loving the horses up. Seems that Karen passed the horse gene on to her children. Thanks for the great comment – Karen is a wonderful person and great rider. She is helping me teach CJ to jump. Unfortunately, I don’t have the experience jumping that the two of you have. My comfort level is around 2 to 2.5 feet, but I’m sure CJ can jump much higher. Great article! I knew Karen as a fellow boarder at Hilltop Stables. My memory of My Guy was a beautiful chestnut with (if remember correctly) 4 white socks. Karen was a beautiful rider back then, as I’m sure she still is. Have been living in New England since those days but thinking of returning to NJ. I miss the beautiful horse trails and fields following the Spring Valley Hounds as Karen did. So glad to hear Karen is doing well! The Watchung Horse Show was one of my favorites! My very best wishes to Karen! Wow. I was just surfing the net and came across this article. It seems that a Karen and I followed similar tracks, I’m sure we must have run into each other. I, too, started at Watchung, got my first horse at 16, moved him to New Vernon, to a barn right across the highway from Hilltop. I remember Clarence. He used to let me hack over and use his ring and I remember the trails up behind the barn. I hunted with Spring Valley a few times. However, I, too, realized that there was no future in horses, except maybe as a vet, but mid way through college I switched to pre med because I could see how vulnerable the horse world was to things like recessions. I sold my horse, but never gave up riding. Except for a couple of years of residency in Boston I was lucky to find horses to ride, and as soon as I could I got another horse. I now live in New England. I’ve switched to dressage, and I own five horses, and a farm. I have come so far since those early days, but it all started at Watchung Stable.